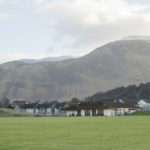 The rugby players of Islay High really wish spring would arrive as soon as possible after battling wind, rain, cold, and snow over the last few weeks. However, some hot action on the pitch has kept spirits up. After a trip to Oban in February was cancelled due to a snow-covered pitch, both boys and girls made it to Lochgilphead on Sunday March 3. The U/14 boys played three games, gaining a brilliant win against Oban, a narrow defeat against Lochaber and a forgetful run out against a far too strong Mid Argyll team. The U15 girls played a tough match against a combined Oban/Mid Argyll team. The girls took some time to ‘defrost’ after a three-month gap since their last game, but quickly got back into their usual hard tackling and devastating running. The score was 15-8 to Oban after 40 minutes, with the last 20 minutes spent in ‘coached game’, to give both teams some final tips before their respective upcoming Cup matches. While the boys were travelling to Murrayfield, the girls made their way to Biggar RFC for the first round of the Scottish Club Cup. After glorious sunshine for the journey over on the Saturday, the weather took a turn for the worse at breakfast time on the Sunday. After getting over the excitement of seeing snow, the girls prepared themselves for battle, and shortly afterwards 15 ice maidens emerged from the changing rooms to face extremely challenging conditions. Frustratingly, the continuing snow flurries replaced the usual blizzard of tries and tackles, and the match lasted a mere 22 minutes before being abandoned due to the deteriorating weather. Unfortunately the Islay girls were losing 15-0 at that point so they will now continue in the Shield competition. However, the girls showed great strength of character and team spirit to get through such tough conditions and will regale their friends and family with tails of their heroic feats (and frozen feet) for weeks to come. 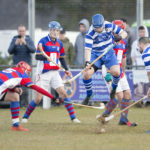 The boys and the girls are looking forward to their future matches, with the boys travelling to Argyll again for the Dalraida Festival, and the girls awaiting the next draw in their competition.